I came to canoeing almost by accident when some lifeguard staff training in Yellowknife included a canoe instructor course. And so began a love affair with the paddle that has included all aspects of paddling from poking about on tiny ponds and creeks to solo open boating a section of the Kicking Horse River. Since thirty years ago, I have guided, taught and paddled in Ontario, Saskatchewan, Alberta, B.C., the NWT and the Yukon. I have worked in the outdoors with Yellowknife Parks and Recreation, University of Alberta Dept. of Phys. ED., Calgary Canoe Club, Calgary Parks and Recreation, Canadian Red Cross Society, University of Calgary Outdoor Pursuits Center and the Canadian Outward Bound Wilderness School. In 2003 I did my first trip with NRA on the Snake River in the Yukon. 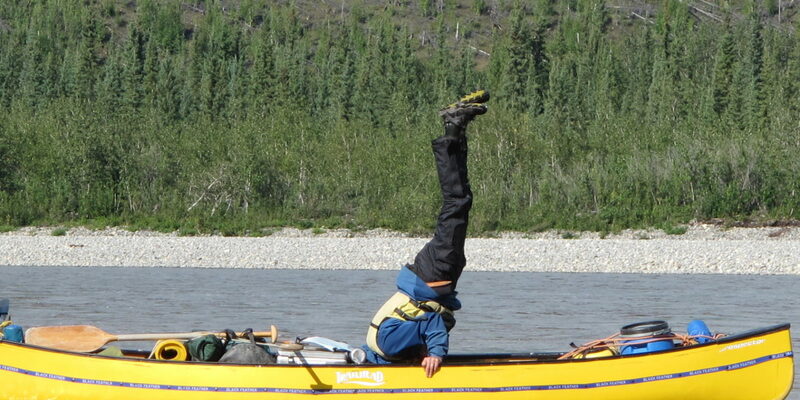 I have since then done more trips on the Snake, the Wind River and the Nahanni River. My favourite thing about guiding is spending time in awe inspiring natural places with like minded people. I call Carcross, Yukon Territory home. When not guiding I work as a carpenter and doing home energy evaluations. Other outdoor activities I enjoy include xc skiing, snowshoeing, hiking, birding and photography. My favourite outdoor things are: “the scenery, the wildlife, the water, the air, the weather, the rocks, the trees, the plants…just being there!